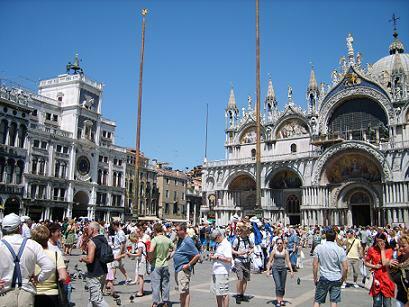 Piazza San Marco is one of the most famous places in Venice. Attractions at St. Mark’s’ Square are the Basilica, the Campanile Tower, Doge’s Palace, the Clocktower and the Correr Museum. In the area around St. Mark Square are lots of shops, luxury boutiques and restaurants. 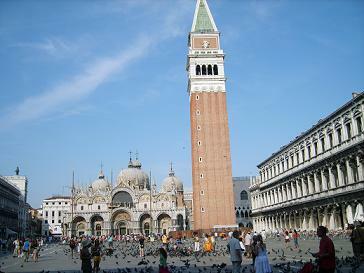 St. Mark’s Square was build in the 9th century and was enlarged to its present size in 1177. It always has been seen as the centre of Venice because all the important offices of the Venetian state were here. The original Campanile Tower collapsed in 1902 but was rebuild afterwards. 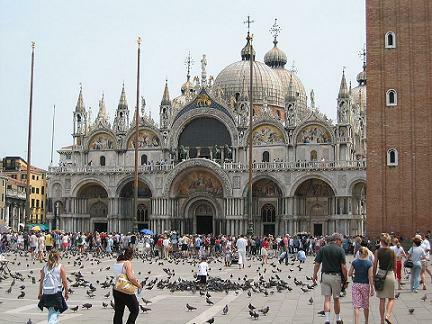 Saint Mark’s Basilica is the most important cathedral in Venice. It was build in the 11th century and dedicated to Saint Mark. He was one of the seventy disciples of Jesus Christ. The Basilica’s roof, hall and exterior have been redesigned afterwards frequently. The floor and walls have thousands of mosaics and the ceilings of the domes are covered with gold. The Basilica became a symbol of the Venetian wealth and power. The Clock Tower was build at the end of the 15th century and is standing next to the Basilica. In the past, ships on the Grand Canal which were sailing out could see the time. The archway under the clock connects St. Mark’s Square (political centre with the Doge’s Palace) and the Rialto (the financial and commercial centre of Venice). The Rialto is an area full with luxury boutiques, shops and restaurants. The main shopping street is the ‘Merceria’. 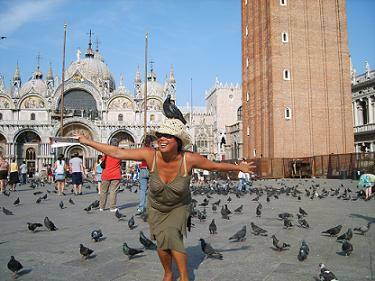 St Mark’s Square does not only attract tourists but also pigeons. The pigeons are tame and sit on people’s hands, arms and hats. After a municipal ordinance in May 2008 it was no longer allowed to feed the pigeons. Tourists sit in the shadow; temperature can be easily 30 degrees Celcius in the summer months. Before you order some drinks, check the prices. Sitting here on a terrace is one of the most expensive spots in the city. 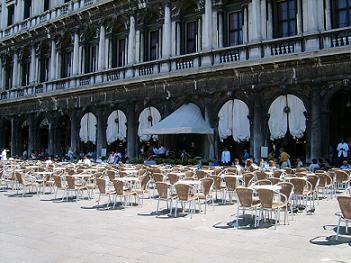 Seven tourists from Rome ordered 4 coffees and 3 liqueurs at the outdoor cafe of Caffe Lavena in St. Mark’s Square. The coffee was €6 and the liqueurs was €10. However there was also a ‘music surcharge’ of €6 per person. The bill was €100. If they had drinked their coffee inside standing at the bar it was only €1 told the manager….